Update: We are still in need of a few volunteers and a few craft items. If you are willing to volunteer or send in some craft/game items, please sign up here. Your child should have brought home a pink sheet yesterday that explained a bit about our end of the year celebration. Below you will find that information as well as the updated food and drink donation list. The students have been hard at work planning our End of the Year Celebration for Wednesday, June 7th! The students separated into committees to make decisions on the activities and refreshments for our party. Lori Thompson will be contacting you about the volunteers needed as well as some craft items that we would love to have donated. One of the crafts that our craft committee chose is tie-dyed shirts! If you could please send in some sort of white clothing for your child to tie-dye, I would greatly appreciate it. (shirt, socks…etc.) Please have the clothing items in by Friday, June 2nd and make sure that they are clearly labeled with your child’s name or initials. I will do the necessary preparations for the clothing items so they will be ready for the tie-dye process. If you cannot make it to the store, I will pick up some extra shirts that students can use. We would also love if you would be willing to donate some of our lunch and refreshment items chosen by our food and snack committees. If you are willing to supply any of the items below, please circle the item(s) you would like to donate and send the bottom portion of this paper back to school with your child by Friday, June 2nd. I will send home updates of the items that have already been accounted for every few days as well as post the updated list daily on my blog. I will contact you with more information regarding the time we will need the food or drink you chose to donate. Thank you so much to everyone that has volunteered to donate food or craft items for our end of the year party on Wednesday June 7th! We now have everything that we need! As most of you know, our class hatched chicks this year. We had a decent hatch and had 7 chicks! Unfortunately, one of our chicks was born with splayed legs which means that his legs were out beside him and they were not strong enough to support him to walk. After researching what to do, I found that you can bandage the chick’s legs together which causes the muscles to grow correctly to support it. After a few days of being bandaged, our little chick was able to walk on his own! 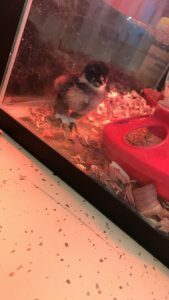 🙂 Since our little chick needed some time spent alone to grow stronger, we asked Mrs. Muhr’s class to keep our other chicks in their tank since unfortunately none of their eggs hatched. However, once our little guy was strong enough we were able to put some friends back in with him. The kiddos loved seeing the life cycle of a chicken in person. They also adored the chicks! Each student in my homeroom was given the option to hold one of the chicks. Most of them decided to hold one.